Seidenberg students have gone back to middle school because they missed it so much. Not really, but this is one middle school that our students may wish they had attended! The Isaac Newton Middle School School for Math and Science recently received a grant from Apple to the tune of one million dollars, with an end goal of each and every student at the school being equipped with an iPad to help them engage better with their education. Modern technology is increasingly being rolled out in primary and secondary education, with several similar initiatives like providing students with laptops and other personal devices arising within the last few years. This time, it’s Isaac Newton MS for Math and Science’s turn, and we’re excited to be a part of it! 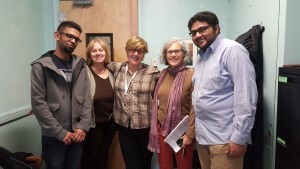 Top Seidenberg graduate students Bhushan Suryawanshi, Jigar Mehta, Hardik Patel, Dhruvil Gandhi and Pratik Dhiman have been visiting the school in order to provide support with getting its technical infrastructure up and running. Together, the students are modifying existing smart class and smart board tech to get it at par with the requirements. The school’s computer lab is also being modified to a greater standard, and they are also setting up the iPads and classrooms for new tech. Different applications on iPad and smart class together will make the class more interactive, which can have far more appeal to middle school students who are growing up with access to various kinds of technology. With this generous grant from Apple, we’re confident the school will put its brand new tech to good use – and maybe we’ll see those students again come college application time!